Bharti Airtel has been regularly providing updates to its My Airtel app and thereby making it a feature rich application. According to a tip received by us, Airtel will be adding a new feature that displays your data usage on a daily basis. With this feature, users can keep track of applications that are consuming more data on their phones. As you can see in the image above, not only mobile data, users can also see the Wi-Fi data usage. Airtel will also display the usage history on a monthly/six months basis. 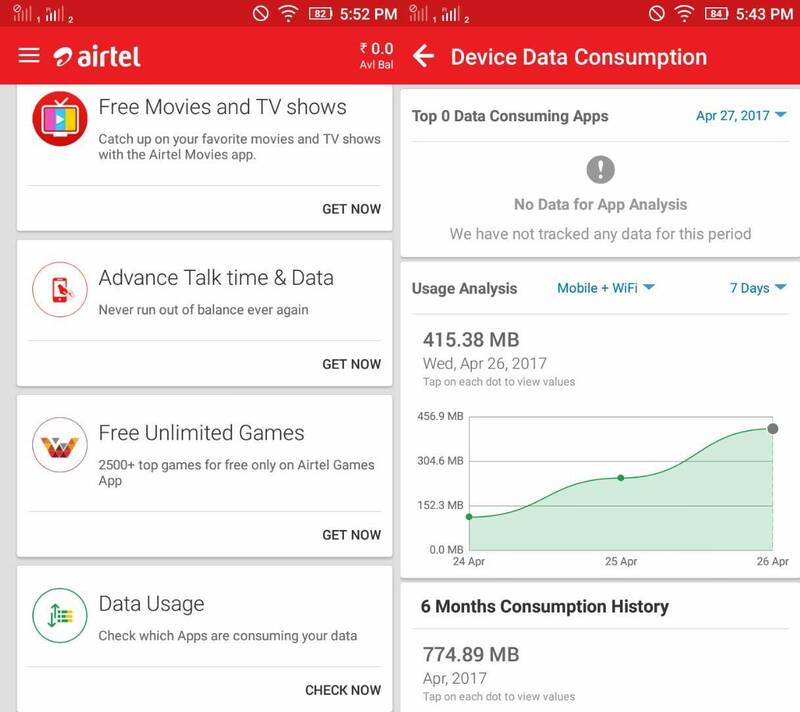 The company recently updated its web portal as well showing the data usage, but in the My Airtel app, it displays the per application usage, which is a good thing. However, this feature is a bit repetitive as the Android OS has this feature inbuilt from a long time and also shows accurate data info. Nevertheless, this one will be useful for the iOS users. We couldn’t find any data when we tried to check the feature in the application at the time of writing this article. Airtel might be rolling it gradually. To check out this feature, make sure to update the My Airtel application to the latest version. To check whether you’ve received the feature, open the My Airtel app and scroll down to the bottom of the home page, where you can see a new ‘Data Usage’ menu. Click on that, and you’ll be taken to the main screen of the new feature. With this new addition, the country’s leading telecom operator is once again looking to combat Reliance Jio and its MyJio application, which also displays the information regarding the amount of data consumed. However, My Jio lacks the per app usage feature. Also, My Jio application is far ahead of My Airtel app because it also displays the number of calls you made to particular number every day along with the number of SMSes sent as well. Don’t be surprised if Airtel brings the same features to its My Airtel app as well. Jio does the same. They even boasted in 2016 about how they can analyse customer usage patterns and sell that information. This is one of the reasons why they offer movies, magazines, music etc free – they can get more money by selling your preferences to advertisers instead of asking you to pay for these services. JIO guys in my city say that airtel is using 1998-99 era 4G technology..? Dont know whether they are right? There was no 4G standard in 1998-99. Forget 4G, even 3G was not commercially deployed until 2001/2002. Lol its just an example of their ignorance. Their entire workforce is simply sub standard. They are a bunch of idiots only. This oldest technology works 1000 times better than crap jio.